Thistles and Crowns: The Painted Chests of the Connecticut Shore is the first exhibition since the 1950s to offer an in-depth look at a fascinating tradition in eighteenth-century Connecticut furniture. 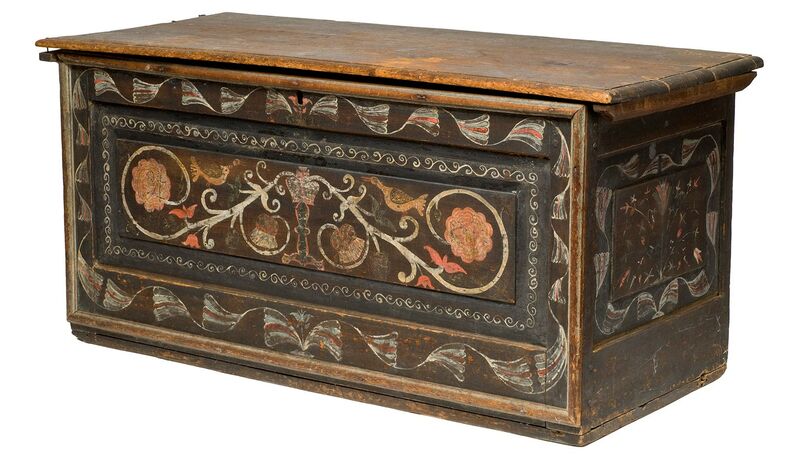 Between 1700 and 1740, a small group of craftsmen created a distinctive group of painted wooden chests in Saybrook and Guilford, Connecticut. Roughly two-dozen examples survive, six of which are featured in the exhibition. Thistles and Crowns highlights the richness of this Connecticut tradition and the complexity of its history. Although these chests have been beloved icons of American vernacular design since the early-twentieth century — the Metropolitan Museum acquired two examples in 1909 — their early scholarship was marred by misinformation and misidentification. New research and analysis allows for a more complete story to be told about who may have made these chests and why they look as they do. Thistles and Crowns examines the way these chests were made, the meaning behind their sophisticated decoration, their functions in eighteenth-century Connecticut homes, and their modern legacy. The six chests in the exhibit come from major national museums and local historical societies. 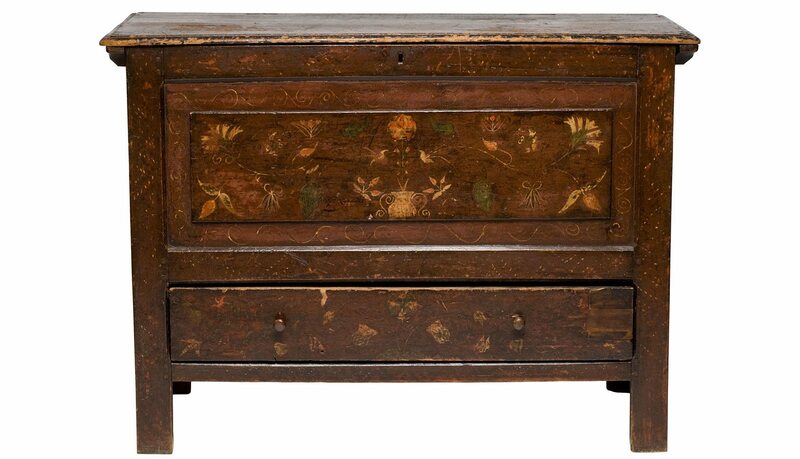 One example on loan from the Henry Francis du Pont Winterthur Museum in Delaware and another from the Old Saybrook Historical Society in Connecticut both exemplify the decorative vocabulary of the chests. Embellished with rich compositions of foliage, birds, vines and flowers brightly outlines against a dark background, they show Connecticut craftsmen adapting a fashionably Baroque sensibility for expressive ornament and decorative surfaces with their familiar tools. Incorporated into these decorative motifs are signs and symbols like Scottish thistles, British crowns, Tudor roses, and French fleurs-de-lis, all carrying specific connotations for contentious political issues when these chests were created. Useful in their form and beautiful in their ornament these chests tell a complicated story about the way that colonists in eighteenth-century Connecticut used humble objects to express their place in the larger world. The accompanying catalogue, Thistles and Crowns: The Painted Chests of the Connecticut Shore, written by Assistant Curator Benjamin Colman, provides permanent scholarly contribution to the field and encourages further study of this overlooked tradition in Connecticut’s material culture. The book outlines a larger group of chests beyond those included in the exhibition. The 72-page softbound catalogue with 74 full-color illustrations can be purchased in The Shop at the Florence Griswold Museum or online here. The price is $24.95.